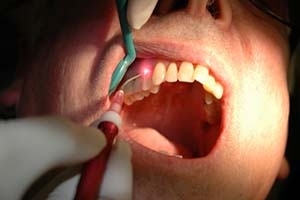 Dental Lasers... a boon for patients and doctors alike... they help provide painfree and blood free dental procedures. Lasers (LASER - Light Amplification by Stimulated Emission of Radiation) offer precise and effective solutions for many dental problems. The potential for laser dentistry to improve dental procedures rests in the dentist's ability to control power output and the duration of exposure on the tissue (whether gum or tooth structure), allowing for treatment of a highly specific area of focus without damaging surrounding tissues. 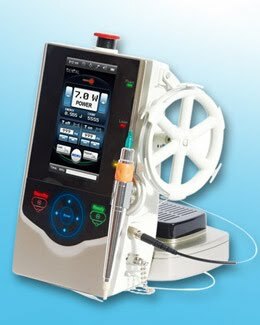 If you consider yourself somewhat of an anxious dental patient and are seeking extreme safety and comfort, you might consider looking for dentists who have incorporated laser dentistry techniques into their practices and treatments. Dental procedures may soon be performed quicker, more effectively and more comfortably thanks to the growing popularity of laser dentistry. Laser technology has been used in various types of medical procedures for years. An increasing number of dental offices around the world will use dental lasers as the technology continues to improve and its cost decreases. Dentists may use dental lasers during a professional dental cleaning to remove tartar and as a replacement for the traditional root planing procedure, which is currently performed using a surgical instrument called a curette that can damage surrounding tissue. 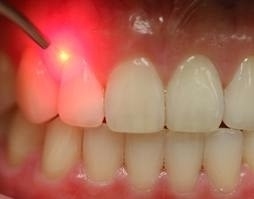 Eventually, dental lasers could make it possible for dentists to access any part of a tooth, replacing the need for the traditional dental drill. This may help to relieve the fear and anxiety many people experience when they go to the dentist. Soft Tissue Lasers: Soft tissue lasers boast a wavelength that is highly absorbable by water and hemoglobin (oxygenating protein in red blood cells), making them more effective for soft tissue management. Commonly used soft tissue lasers include Neodymium YAG (Nd:YAG) and diode lasers, which may be used as a component of periodontal treatment and have the ability to kill bacteria and activate the re-growth of tissues. The carbon-dioxide laser minimizes damage to surrounding tissue and removes tissue faster than the fiber optic method. Hard Tissue Lasers: Hard tissue lasers have a wavelength that is highly absorbable by hydroxyapatite (calcium phosphate salt found in bone and teeth) and water, making them more effective for cutting through tooth structure. Hard tissue lasers include the Erbium YAG and the Erbium chromium YSGG. The primary use of hard tissue lasers is to cut into bone and teeth with extreme precision. Hard tissue lasers are often used in the "prepping" or "shaping" of teeth for composite bonding, the removal of small amounts of tooth structure and the repair of certain worn down dental fillings. Some dental laser technology has been developed that can be used to generate both hard and soft tissue laser energy, depending upon the patient's needs. In addition to the lasers used for cutting and shaping hard and soft tissues, other laser types are specifically designed for viewing the insides of teeth and cells using Optical Coherence Tomography, a non-invasive imaging technique. Other lasers provide energy and specific proteins that help move messages between cells to match the body's natural ability to use light spectrums to heal damaged cells.